So-called doube façades (DF) or ventilated façades, environmental second skins, etc have attracted great interest as modern building enclosures. Numerous examples have been built in Europe but only a few have been completed in North America. The DF label actually covers a wide range of different enclosure types. In most cases, a DF has three layers of glazing with ventilation and solar control devices between the outer two glazing layers, although some ventilate the space between the inner glazings. In most cases, the airflow through the glazing cavity is driven by natural buoyancy (hot air rises) aided by wind pressure differences, although some systems use small fans (often driven by photovoltaics). In hybrid systems, HVAC supply or exhaust air streams are directed through a glazing cavity before connecting with the outside. The ventilated cavity shown schematically in Figure 1 (Page 50) may be extended over the height of several stories, the whole height of the building, the height of a single story, or some combination of the above. The most common solution is the single-story height ventilation space. A single-story space offers the advantages of separating fire, smoke, odor and noise between floors as well as the construction simplicity (and economic advantages) of a repeating unit. The current interest in double façades in temperate climates (i.e., Continental Europe and the UK) appears to stem from several beliefs and desires. Double façades are believed to reduce cooling loads, allow for more or better natural ventilation, facilitate daylighting, increase noise control and reduce heating energy consumption. This paper aims to provide a critical review, at a general level, of the technical merit of each of these beliefs. The scope of this work is for new commercial buildings that are entirely or mostly glazed in Canada and the Northern tier of the United States. Figure 1: Two (of many) Generic Types of Double Façades. Reducing cooling loads can best be achieved, in approximate order of effectiveness, by using opaque wall elements, exterior shading, solar-control coatings on glazing, and interior shades. Many analyses of DFs begin with the assumption that close to 100 per cent of the vertical enclosure must be transparent. This eliminates the possibility of using the most effective and lowest cost means of reducing cooling load. Shading can also be very powerful, but requires exterior shading elements to be truly effective. Reflective glazing is often not seen as an acceptable means of reducing cooling loads since the reflected light can cause glare and overheating of adjoining buildings. Psychologically, reflective coatings also create a sense of separation between the building and its surroundings when viewed from the exterior during the day. Perhaps most importantly, reflective glazing with a low solar heat gain coefficient (SHGC) does not admit as much natural light as clear glazing, with visible light transmittances of below 20 per cent common for reflective windows. This lower light transmittance is not a problem in climates with bright sunshine all year (e.g. Arizona, Florida) but, for Continental Europe and Northern parts of North America, significant portions of the year are dull and overcast. A high natural light transmittance is desirable for psychological and daylighting reasons, and reflective glass usually cannot provide this characteristic. Hence, the solution proposed by a DF is to use clear glass to allow light in, but to absorb and reflect most of the solar radiation that passes through the outermost pane of glass on shading devices. If the cavity in which the shading device is placed were a sealed glazing unit, the heat absorbed by the shades would raise the temperature of the air space and this heat would then be partially transmitted into the building. Some ventilated façades uses air flow—induced by wind pressures and thermal buoyancy—through the glazing space to remove this heat. For this reason DFs are also often called ventilated façades. However, shades with a DF do result in a higher temperature in the space, and exterior glazing slows the rejection of this heat significantly. Shading devices of less than 12” (300 mm) projection that are fully retractable so as not to influence cleaning and to reduce snow/ice/wind loads are both feasible and desirable. The architectural design of these devices is of course critical. In some parts of the world, notably south-east Asia, large horizontal shading devices at the floor line are used that allow foot traffic for cleaning (this load is not a problem since the strength is controlled by wind and snow loads). Consider Figure 1 (Page 50), which compares the total percentage of glazing to the effective solar gain into the building (Solar Heat Gain Coefficient = SHGC) for three types of glazing. If a building has a large percentage of transparent glass, the glazing system must have a low SHGC to reduce solar loads. In fact, this is the reason most all-glass buildings in the past used dark body tints or reflective coating—it is economically prohibitive (for all but big budget buildings) to use clear glass because of the high capital cost of the large cooling system required. Unfortunately, the choice of body tints and reflective coatings reduces visible light transmission. Ideally, one would like to have low SHGC for those times and orientations that receive high solar radiation but maximize visibility and useful winter solar gains (note, however, that very few winter solar gains are needed in well insulated office buildings because of the large internal gains, so this is a relatively unimportant issue). Double-façades, by using ventilated movable solar shading devices behind glass are one way to achieve this ideal. Spectrally-selective glazing with fixed or movable exterior shading is another way to achieve the same goal. Similar low-solar gain performance can also be achieved by reducing the percentage of wall area that is glazed, and this has the advantage of reducing winter heat loss, glare and uneven daylighting as well. Reduced glazing area also almost always results in reduced construction and maintenance costs, as well as reduced embodied energy. The sizing of the plant to control the cooling load will be considered later in more depth. Note: this assumes a SHGC of 0.03 for an opaque wall. DFs have also often incorporated openings for natural ventilation. Issues of natural ventilation are not, of course, tightly connected to the design of a double façade. While natural ventilation and DFs can be designed in an integrated manner, there is no compelling technical argument to do so. 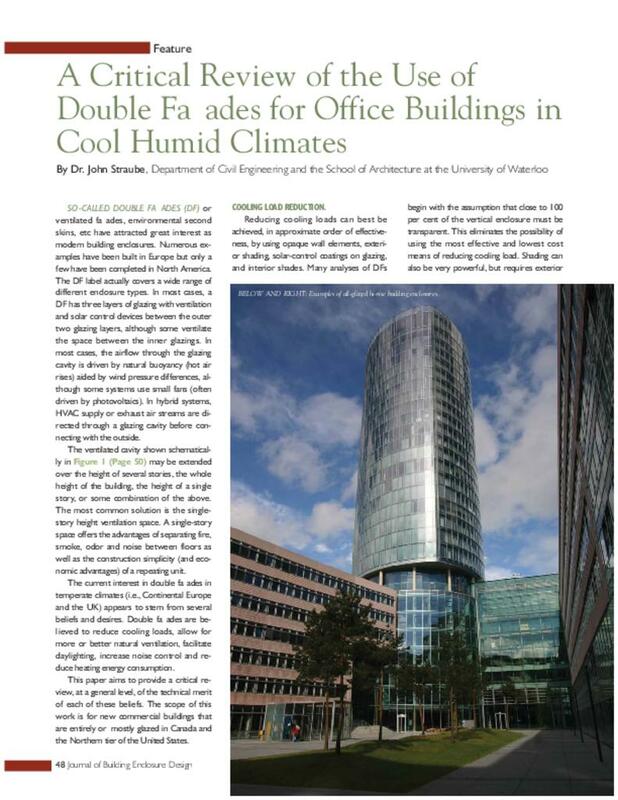 In fact, the differences in climates and comfort expectation between continental Europe and North-eastern North America are significant enough that natural ventilation is rarely of assistance in cooling deep-plan office buildings. Natural ventilation might be used in conjunction with artificial cooling by the careful design of certain building types and occupancies. The space between the two layers of glazing in a DF does buffer wind gusts and thereby helps to control comfort and utility problems with the space inside. Natural ventilation air flow need not flow through windows however. In fact allowing ventilation flow through windows requires means to deal with the simultaneous entry of noise, dust, insects, rain and snow. Protected, operable, screened and sound baffled openings can, and have, been incorporated into buildings. It is also important to realize that many very tall buildings in the past, notably the Empire State Building, Chrysler Building, and the RCA building, used operable windows in conjunction with air conditioning systems without any serious difficulty. Therefore, DFs are not required, and may even be a handicap (in that their summer gains are high), for natural building ventilation. Façades that use large expanses of clear glass obviously increase the amount of light entering a building. Daylighting can save energy (although only when combined with controls that can dim and turn artificial lights off) and is generally preferred by occupants. Daylighting and DF are also not tightly connected issues. Most types of façades can (even should) be designed to provide an appropriate amount of daylighting. The amount of window area required to provide daylighting depends on a number of factors, but DFs are certainly not the only or best way to achieve excellent daylighting in commercial buildings. Properly placed windows (e.g., light shelves and similar) have long been successfully used for daylighting. Double façades have advantages (they can allow lots of light in when it is dull and overcast) and disadvantages (they allow too much light and glare in most of the time, and too much heat out during all cold nights). A façade with 40 or 50 per cent of its area covered in high visual transmission glazing can usually provide plenty of daylight deep into a building. In general, high glazing ratios (over 50 per cent) provide no beneficial daylighting and require special measures to avoid glare and visual discomfort, especially in modern offices that contain computer screens. In some of the scenarios discussed below, it has been assumed that the floor and service distribution system is 2’10” (0.85 m) deep and that a wall projects 3’ (0.9 m) above the finished floor level. This leaves a 6’6” (2.0 m) high glazed band around a building with 12’4” (3.75 m) story heights. The extra daylighting and view provided by adding transparency to this 3’ (0.9 m) parapet is negligible, whereas the additional cooling and heating loads and glare problems imposed by a transparent skin are significant. The addition of a third pane of glass to a façade, along with asymmetrically sized air spaces results in reduced sound transmission relative to typical double-glazed sealed units. The sound transmission of sealed triple-glazed glazing units with asymmetrical airspace sizes is almost always superior to a DF, since there is no direct air connection of the exterior air cavity to the outside air. The DF can provide better sound control if the windows are the primary ventilation opening. Dedicated ventilation openings, recommended above, provide the best in sound performance, and airtight triple or quadruple glazed punched windows also provide excellent sound control. . .